Anyway, it was a few years ago, so it probably helps to listen to this album with an outside-ish hear… “Ain’t Goin’ Nowhere” is the first song I’ve heard before the album was released, and it actually is the perfect song to open this album, since it shows the band under its best light, DOGS D’AMOUR touches with cool cowboy-ish guitars by Thierry Jones (BAD LOSERS, The JONES…) who also appears on the pop stained “Without You I’m Nothing” (not a PLACEBO cover!) Second song “Nobody Knows” is also one of the best tracks on here, mixing cool STONES/JACOBITES guitars/piano with vocals reminding of Jeffree Lee Pierce, one of Guts’ most perciptible influences. The darkest, almost gothic side of the band can be heard in “Dead Love’s Shadow”, and even more on the acoustic Rocky Horror-ish bonus version you can find on the CD. It’s good to see the band exploring these gloomy territories. 15 musicians have been involved in the making of this new album, so you’ll hear a lot of arrangements (strings, saxophone, harmonica, etc.) on “Beautiful Curse.” The spirit of ROWLAND S. HOWARD is floating over “Death & The Girl” and “Night Of The Vampire” (ROKY ERICKSON cover) ; and a good dose of hypnotic 70s rock’n’roll can be heard in songs like “Fire”, or “Way Down To Hell”, which should make every GUN CLUB fan dance. On a different note, I think “Hot On Our Trail” (a great song from the BABY STRANGE days that unfortunately only appears as a bonus track on the CD version) would have been better as a last song instead of “Slow Down”, and the new version of “Black Sorrow” is not bad, but dispensable on a new release since it was already on the previous album. 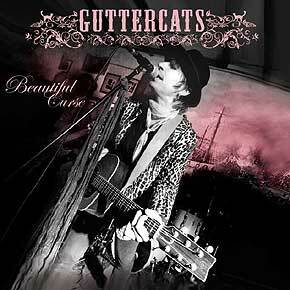 Anyway, “Beautiful Curse” is still the best rock album hailing out from Paris I’ve heard in a while! Now on the resuscitated record label Closer records, the GUTTERCATS are ready to hit the road with their best album to date under their arms… /Laurent C.